REVIEW – Here we go again as I continue my enjoyable challenge of finding the “perfect” earbuds for my taste. So far, I have enjoyed some beautiful contenders, but I still think that somewhere out there are earbuds that will “wow” me beyond my imagination. 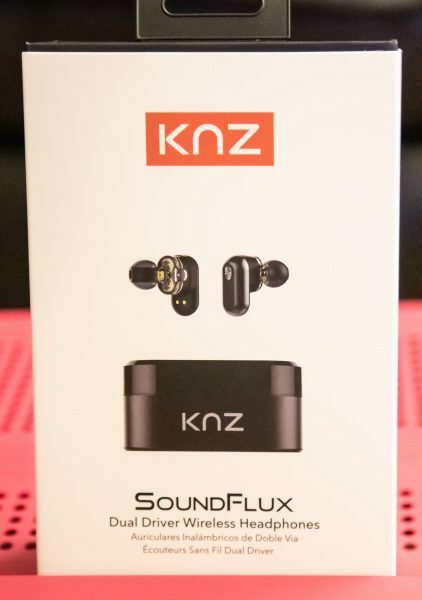 The SoundFlux Earbuds by KNZ Technology are the next contestants. Let’s see how they do! The SoundFlux Earbuds by KNZ Technology are a pair of small and lightweight earbuds that like all others are designed for listening to music and conducting phone calls. As with most earbuds, they should be compatible with most Bluetooth equipped mobile devices. The SoundPass mode allows you to be aware of your surroundings and engage with the environment without pausing your music or taking off your earpiece. You can turn it on to talk to people, noticing traffic; or turn it off to enjoy your own world. These earbuds are small and sleek and angled to fit easily and perfectly in your ears. On the surface of each earbud, there is a sleek silver control button, and above it is a status LED. On the front of the case is the KNZ branding and on the inside, there are the 2 charging slots and connectors. At the back of the charging case, there is an on/off charging button, a micro USB charging port and a status LED. 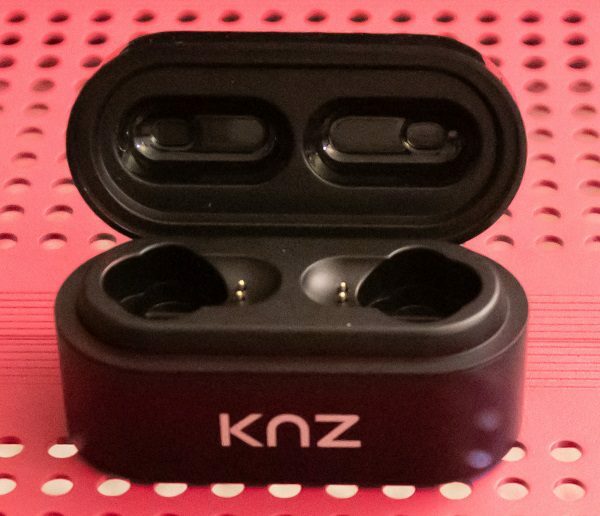 The KNZ wireless earbuds are very attractive and comfortable despite what first appears to be an odd shape. When I placed them in my ears it was obvious that a lot of thought was put into the design because they fit in a way that makes them very secure and they nicely match to the contour of your ears. They are also very easy to set up. 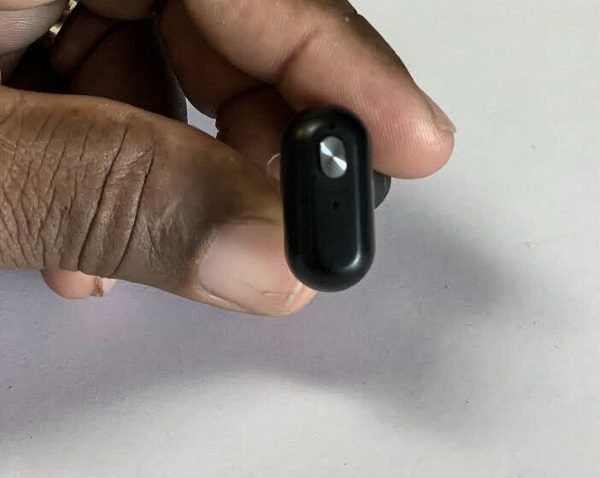 Once you charge them and take them out of the charging case, they go into pairing mode and you just need to select them in your mobile device Bluetooth settings. These are the first earbuds that have managed to take my listening to an entirely new level where earbuds are concerned. In my opinion, these earbuds have managed to cross the line into entry-level audiophile category. The lows, mids, and highs are beautifully separated and smoothly co-exist so that every audio characteristic is nicely present. The maximum volume is as such that there is no distortion and the low frequency is also void of distortion. They do a great job of reproducing the pure musical genres of jazz and classical music as well as my other favorites, like easy listening, ballads, the classics, and gospel, and the reproduction is very detailed. For phone use, they work very well and I did not experience any issues on either side of the conversation. The noise canceling works well, and the Bluetooth connectivity is rock solid. I did not experience even one involuntary disconnection. 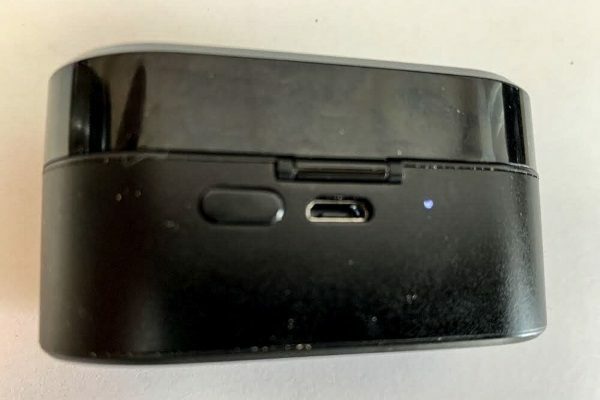 The only issue I encounter is that when I power off the charging case with the earbuds in it, or whenever it automatically powers off after charging the earbuds, if my phone is close, the earbuds automatically connect to my phone. In many cases when I cannot figure out why I am not able to hear a call I answer or make, or listen to audio directly from my phone, I realize that the earbuds have reconnected. The connection is very strong and the functional distance quite long, so this constantly happens when I am walking around my home. My current “fix”. is to physically power them off via their MFB button. For as long as I have been on this earbuds quest, I had my expectations set at a self-determined level primarily because I always believed that earbuds have many limitations that keep them from even scratching the surface of the audiophile category, which so far for me has been dominated by large over-the-ear headphones. These KNZ earbuds have redefined my expectations and made it harder for any future earbud contestants to claim supremacy. For now, KNZ owns the #1 position. Two thumbs up and well done!!! Maybe I missed it in your review, but how long do they last on a single charge? Did you try jumping around any to see if they stay in your ears? I know you are not looking for earbuds for exercise, but I am and I have really small ear canals. I did not have any issues with the earbuds staying in my ears. I can shake my head quite vigorously and they stay put. The design suggests that you will be fine exercising with them. As far as the charge goes, I charged the case about once per week and that is with using them approximately 1 3/4 ~ 2 hours daily. One other note… the new firmware end of this month is supposed to fix the other annoyance… volume imbalance between Left/Right!! Yes! I have the same problem with them randomly connecting to my iPod even when they’re in the case, which is a hassle because the battery drains. So I switch them off with the MFB before I put them in the case too. I wonder if it’s because they’re not secure enough in the case, so they connect to the device the moment they lose connection with the case. The absurd power button on the case and the random pairing makes the already paltry 2 hour battery life even worse. Forget about putting the case in your pocket because that will often power the buds on via the ob/off button on the case. The sound IMO is also flat and disappointing. 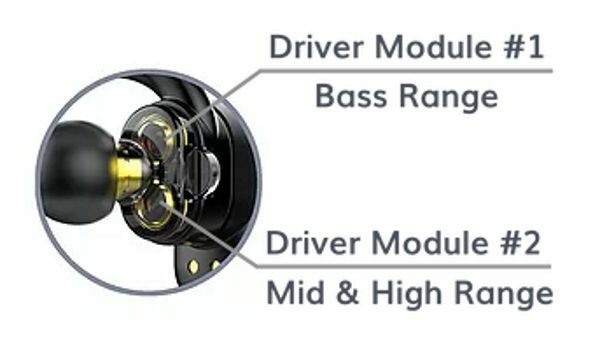 There’s more to sound than just adding more drivers. Overall, I think the Soundflux is a pretty lousy set of buds. You say only 2hr battery (run) time (?) But previous post states using them for 1 to 2hrs and only changing once a week. I use them between 1 ~ hours everyday when I go back and forth to work which is 5 days each week. I have to charge the case once weekly. Hi, I am now experiencing ‘single’ connections with the earphones, and I cannot for the life of me get them to pair as ‘one’. I have tried everything suggested in the manual, but no joy. I concur with the review. I love these earbuds. I’m a professional musician and I am extremely pleased with the response throughout the whole range with no distortion. I enjoy listening to jazz, rock, classical, etc. instrumental, choral…you name it. Great earbuds and they are so comfortable. I, too, am getting around 2.75 to 3 hours of battery on one charge at around 80% volume level with continuous music. I am enjoying the sound of these compared to theirs. the bass is well defined without distortion and the highs are crisp and clean. The only knock is the battery life/charge. It’s advertised at 3hrs and doesn’t come close. 1.5-2 hrs per charge max. 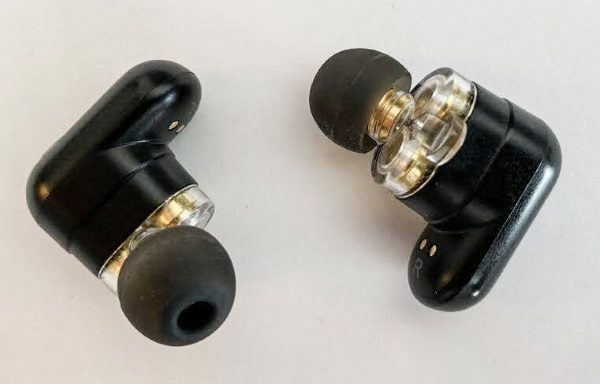 Functionality / Sound – (4): I was disappointed when I first listened to these earbuds. They were marketed as having superior sound due to the two driver system in each earbud, but this claim falls short. The sound is decent but nothing superior. I have previously been using some cheap amazon wireless headphones (Anker i believe) prior to this. In my opinion they dont sound any better than the sub $20 amazon earbuds. The amazon earbuds have a higher maximum volume even. I usually have my previous earbuds set between 1/2 and 3/4 volume when listening to music at the gym. These earbuds would have to be set to over 3/4 almost max volume to have the same level and tone as my previous earbuds. Even at that level, I cannot distinguish a difference between the two in sound. One plus is they do have a decent amount of “noise cancelling” ability. Nothing like a dedicated noise cancelling headphone but a little better than your standard earbud. The sound is not bad but it is nowhere near the superior sound they were being advertised as having. The 3 preset EQs built in are practically useless. There are only subtle differences in each and they are barely distinguishable. 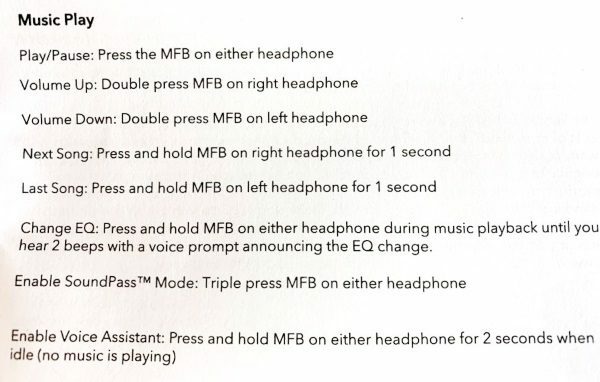 Also, the earbuds were advertised to have a “soundpass” mode which allows you to still listen to music but amplifies the surround noises if you need to talk to someone. This was one reason why I bought the earbuds but this is a DISASTER! When you activate soundpass mode you can tell that sounds are amplified but god forbid you actually say something and your ear drums will explode. I tried talking to a friend and the sound of my voice was so loud that it was deafening. My friend’s voice, about 3 ft away, was barely distinguishable. Yes, I could hear him but it was not great and barely better than no soundpass mode. I would never use this feature because of the way your own voice is amplified. It is like talking with an extremely loud echo. I tested a phone call with the earbuds and the voices were very crisp and clear on the wearers end (a plus for earbuds). The only issue is that the caller said they could hear loud scratching noises at times. I moved around in my area to ensure my cell service was strong and they said the noises would come and go at random times. I am not sure what causes this but it is very interesting as I had to repeat myself many times. I let a friend try them out and tell me what he thought. He was not a fan and could never get the different functions of the buttons on the earbuds. He would try to enter soundpass mode (3 quick presses) and the music would stop. Try again, and then Siri activated. Once more, and he redialed the last phone number. He got frustrated and gave up. I had issues as well getting music to play / pause and enter / exit sound pass mode. I also ended up unintentionally calling someone trying to figure out the “presses”. Conclusion: Many of these features sound great on paper and in advertising but when it comes to execution…. I have no doubts that these could be great earbuds with a little more R&D. 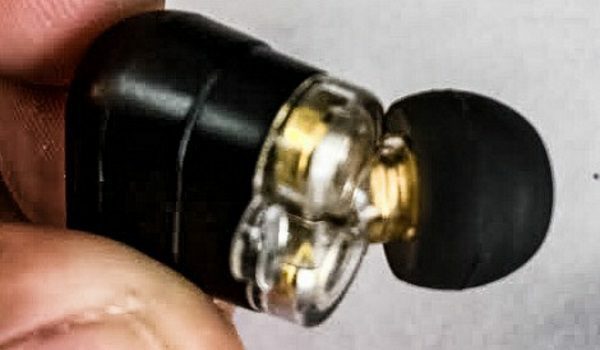 I do not think these earbuds are worth the money and advertising hype. There is no distinguishable difference in the “dual driver” set-up used in these earbuds. To me they were no better than the $20 Amazon earbuds I have. The marketable features of these earbuds fall short and need more development. Soundpass mode is a great idea but poorly executed. Preset EQs are no substitute for a custom EQ via an app or something else. Call quality was great when it worked properly and only posed issues on the receiver’s end. The charging case appears to be good quality but is not something I would throw in my pocket. Lastly, The earhooks are a great feature for gym or activity use but you have to remove them every time you put them back in the case. The earhooks appear fragile and I dont know how many times on and off they would take before breaking. I think there are a lot better options for the price or even cheaper.